Who knew that the fall and winter would be so busy in the wedding industry! We've been so focused on getting to know all of the beautiful venues, vendors and brides around here, that this (our first!) blog post comes a little late! As a new event and wedding manager in British Columbia's gorgeous Okanagan, we at Joie & Luxe were looking for opportunities to network with other industry professionals. A collab shoot seemed like the best idea, so we started looking for ambitious, vibrant and excited professionals who would be keen to do a collaborative, styled shoot. We were so lucky to be a part of this awesome group of ladies! With the onset of fall, came the opportunity to stay inside and create an ultra glam, wedding photo shoot in one of BC's most famous wineries. 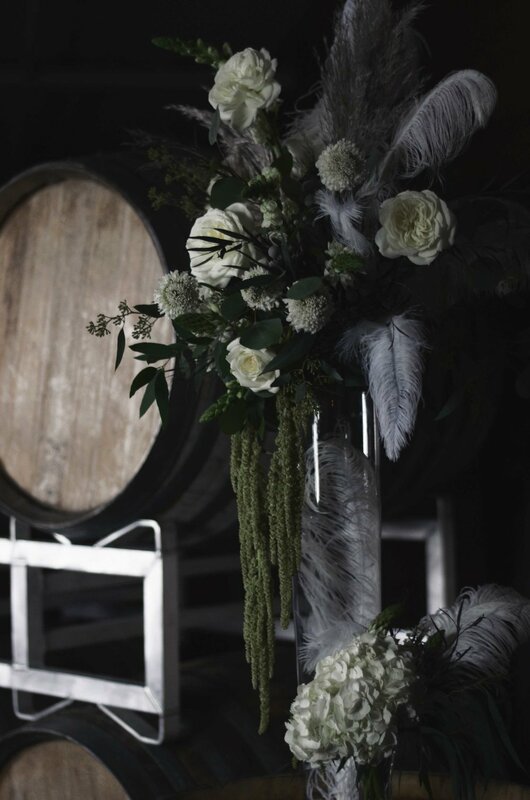 What better theme to go with than the Roaring 20s in a beautiful lakeside winery? The 1920s were a time of extreme opulence and luxury and there was no such thing as 'going overboard.' A decorator's dream! Weeks were spent watching movies like the Great Gatsby for inspiration and curating vintage glam pieces. Gold and bling along with a healthy dose of pearls and feathers were the name of the game. 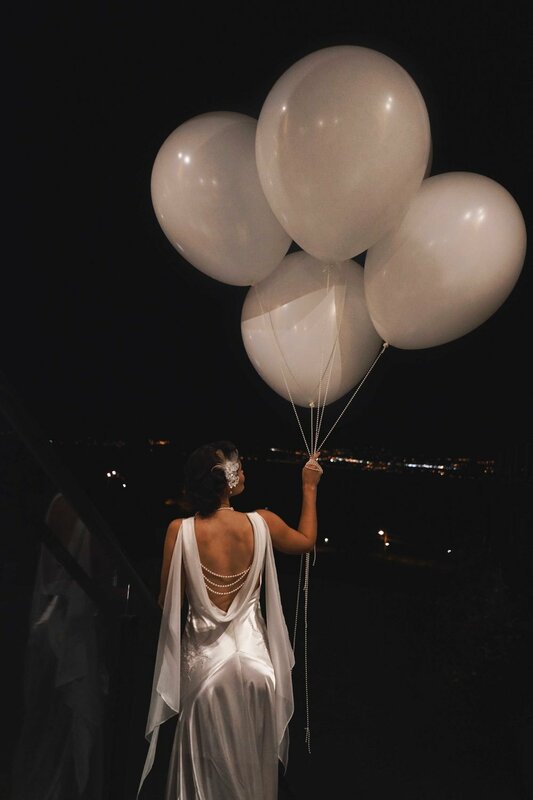 From oversized balloons tied to strings of pearls to gold rimmed wine glasses and gold cutlery, every effort was made to lend a touch of luxury to every element of the shoot. The tall and dramatic floral arrangements from Landmark Flowers, rounded out with art deco style invitations, table numbers and menus contributed to a quintessentially opulent roaring 20s theme. Thanks to the talented duo at Take Two Foto and the already stunning setting at Summerhill Pyramid Winery, achieving the desired look was an absolute breeze. Our beautiful model, Amy Piquette, of Shine Models, wore a one of a kind, flapper style, couture wedding gown and matching occasional headpiece, deftly threaded through beautifully soft equally flapperesque hairdo by Pomme Salon, who also lent us their talent for Amy's rich, dramatic make up. An amazing shoot with so much amazing talent! We are looking for our next project with each and every one of them!